Thursday, 3:30pm CT—I hope everyone is enjoying the pleasant weather. At mid-afternoon the temperature in Houston is 90 degrees, with 45 percent humidity and mostly sunny skies. It is hard to beat this for the end of August. 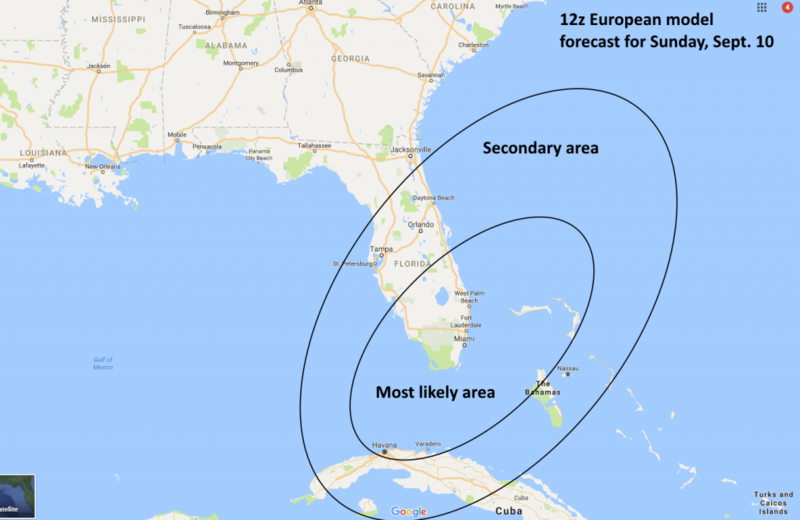 With that said, we wanted to provide a quick look at three tropical systems of interest because there’s been some chatter and concerns about them. When we see low pressure systems in the Gulf at this time of year, normally we’re pretty nervous. However a cold front seems likely to move into Texas next week (reaching Houston perhaps by Thursday), and this should keep any tropical mischief south of the upper Texas coast. At this time we do not have major concerns about heavy rainfall next week, although we’ll continue to monitor the forecast. What we are doing is starting to get excited about the season’s first cold front, arriving about two weeks early (if it does in fact make it through). As expected, Irma blew up quickly with 100-mph winds, and growing, due to a favorable environment for strengthening. We are going to sound like a broken record here, but while Irma is worth watching as Texans, we are probably going to be on the sidelines for this. The important caveat here is that Irma is 10 days away from the United States, and there is a pretty broad divergence in model tracks after just five or six days. So there is absolutely ton of uncertainty when we try to talk about effects 13 to 16 days down the line (if it were to track westward into the Gulf of Mexico eventually). If I lived in Florida or the US East Coast I’d be pretty wary about this storm. But because it is so far out from making a US landfall—if it even does come into the United States—I am not prepared to rule out anywhere from Laredo to Maine. For now our advice remains the same: Watch Irma if you want, but don’t worry about the storm. 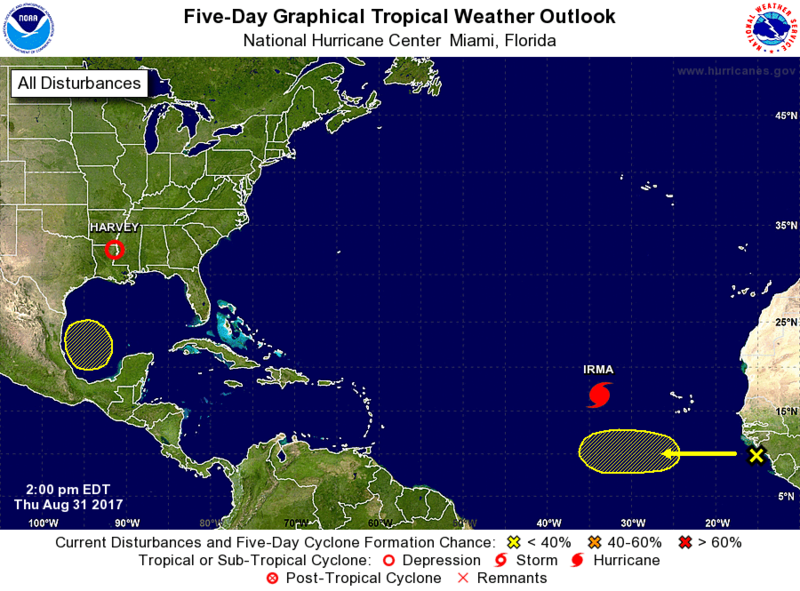 The odds seem pretty low that Irma will come to Texas, and if it does we’ll have plenty of time for warnings. Plenty. of. time. Can you tell that we’re in the heart of the Atlantic hurricane season? Yet another storm is likely to form over the next week or so in the deep tropics (it would become Jose). Our best guess is that this will become a “fish storm” and not affect any major landmasses. But we’ll be watching this one, too, just in case. Thank you so much for breaking this down. People are on edge, and it is nice to have someone who can help us understand those yellow blobs. How worried would you be if you lived in Puerto Rico? Thank you for what you do. I’ve been following your writings since “Should Katy Evacuate?” became a joke about storm surge. Tell me again the magic date in September when the probabilities of storms hitting Texas drop of. I want to count the days. It’s around the third week of September. I usually mark my calendar at the 22nd, but for sure October 1. To me, October 1 is sort of magic. Fall is starting. All the sports are actively playing. And hurricane season, at least for Texas, is basically over! The historical peak for the tropical storm season centers around September 10th. After this date, the frequency of storms begins to recede until the official end of season date of December 1st. Once Sept. 10th rolls around, it is still possible to have named storms. Rita in 2005 came through and landed on 9/24. I agree. Perhaps they can test my idea to unstick Harvey – use high yield thermonuclear weapons. Could you comment on the wind direction in the last few days? The air in Houston following the refinery releases on the ship channel has been awful, heavy, dirty-feeling. Headache too. Also now there are those explosions and fires at the chemical plant in Crosby. Thanks for all your hard work. Much appreciated. Well, I looked up the wind direction myself. Mostly northwest. So not blowing from Pasadena and Crosby. Still, the air felt ugly and weird in Houston. Evaporation? One thing is for sure, it has been SUPER dry, much drier than normal, but when you factor in all the water in the ground evaporating, it’s felt really weird to me too. Sort of heavy and my allergies are crazy. Tons of mold spores in the air. As I recall one reason Hurricane Rita lost some steam in 2005 is because Katrina had churned up the Gulf of Mexico so much, that the water was cooler than average at the time. Am I remembering this right? And if I am, is the water in the Gulf now cooler than normal and will this affect the yellow blog at all? On Sunday, September 10 my wife and I are flying to Miami for a cruise that sails on Monday, the 11th. First stop, Havana, on the 12th. So, even though we live in Houston and have just survived Harvey pretty much intact, we are watching Irma very closely. Please do what you can to move it much further north by September 10 or 11. I know you can do this. You’re that good! One of my coworkers had plans to go on a Carnival cruise that would have sailed out of Galveston this past Saturday(I think). Harvel cancelled his cruise. Hi. Different topic question: can a Harvey-type event happen in the North East Coast and the precipitation type is snow (in the cold season, of course)? As they say, an inch of rain is equivalent to 12-15 in. of snow. I’ve been to a few blizzards myself, but would be interested to know the fact that a mother of blizzard event is possible. The cool front will be welcome news to those of us on start-up duty next week. We live in Jax, Florida and are refreshing our hurricane supplies. Thanks for all the info. Headed to destin florida on the 9th of September should I be worried about Irma? AYE! Though I’d miss my daily weather reports! A hurricane making landfall in Laredo would be rather novel! The eye could go right up the Rio Grande. Glad someone else picked up on this! I am so thankful for your explanations and your “no hype”. Wunderground used to publish the European Ensemble Models – graphically. Do you know why they don’t any longer or if someone else is publishing them now? All the tabular data is OK if you have HOURS to digest it, but the graphic representation is instantly understandable, as you are well aware since your postings seek to make sense of tons of data points. Do know a link to that you feel comfortable sharing that presents graphically what the tabular data is trying to say? It seems that making reams of tabular data more palatable seems to be a big part of your mission on Space City Weather. Thanks for your time & effort to make this weather information more understandable! This has been a tough week. Thanks for the good reporting. Areas the cold fronts impact become quite rare.